The test match, a part of Dortmund's winter training camp, was a fairly uneventful occasion with a single goal from youngster Jan Gorec Stankovic separating the two sides. Dortmund fielded a less experienced line-up, also making many changes during the half-time interval. The training camp involves two training sessions a day and there did appear to be some fatigue from the Borussen, which is hopefully a good sign of the progress being made in Spain. That said, goalkeepers Roman Weidenfeller and Zlatan Alomerovic had little to do in either half and Sion were limited to almost no chances. BVB again failed to finish some chances to increase their lead, but were not punished for it this time. FIRST HALF LINE-UP: Weidenfeller, Piszczek, Hummels, Ginter, Dudziak - Sahin - Grosskreutz, Gundogan, Kampl, Passlack - Immobile. Dortmund began the match in a 4-1-4-1 formation with many new faces for Dortmund fans. 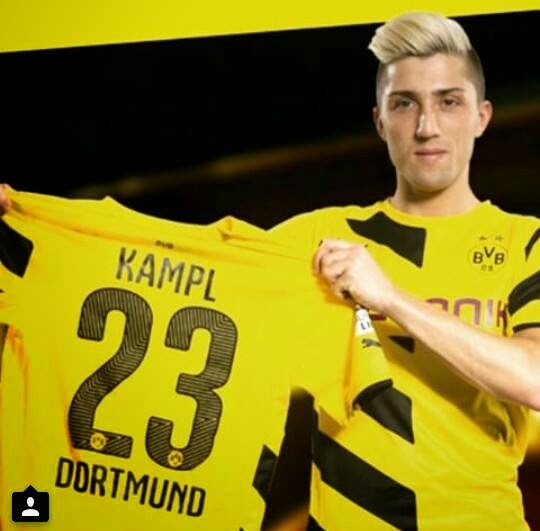 New signing Kevin Kampl made his first appearance for the club, showing glimpses of the potential spoken of by almost all of his former coaches. Jeremy Dudziak, the lefty, would play left back, featuring along with young prodigy Felix Passlack who played on the right side of midfield. Hummels was strong in tackles as always and Gundogan looked keen to get on the ball as much as possible. With Ilkay, the more he touches the ball, the better it appears to be for Borussia Dortmund (see his 147 touches v Nurnberg in January 2013). There was little to talk about in the first 45, but Dortmund's referee complaints can continue into the new year as they were denied a clear penalty as full-back Dudziak was undoubtedly brought down in the area. Somehow, the referee didn't point to the spot, unlucky for Dudziak, who had an impressive performance. 16 years young Passlack was probably the most noteworthy player of the first half--appearing to fit right in with the big boys despite being young enough to be the child of many of his team-mates and opponents. Physically he is mature beyond his years and he seems to possess plenty of skill as well, a really promising prospect for BVB. SECOND HALF LINE-UP: Alomerovic, Schmelzer, Subotic, Gorec-Stankovic, Passlack - Kirch, Kehl - Dudziak (62' Harder), Jojic, Blaszczykowski - Immobile. Stanko and Subo: twin towers in defence. Dortmund began the second half in a 4-2-3-1 formation with eight changes to the starting eleven. Alomerovic stepped in between the sticks while Schmelle returned to his usual left back position. 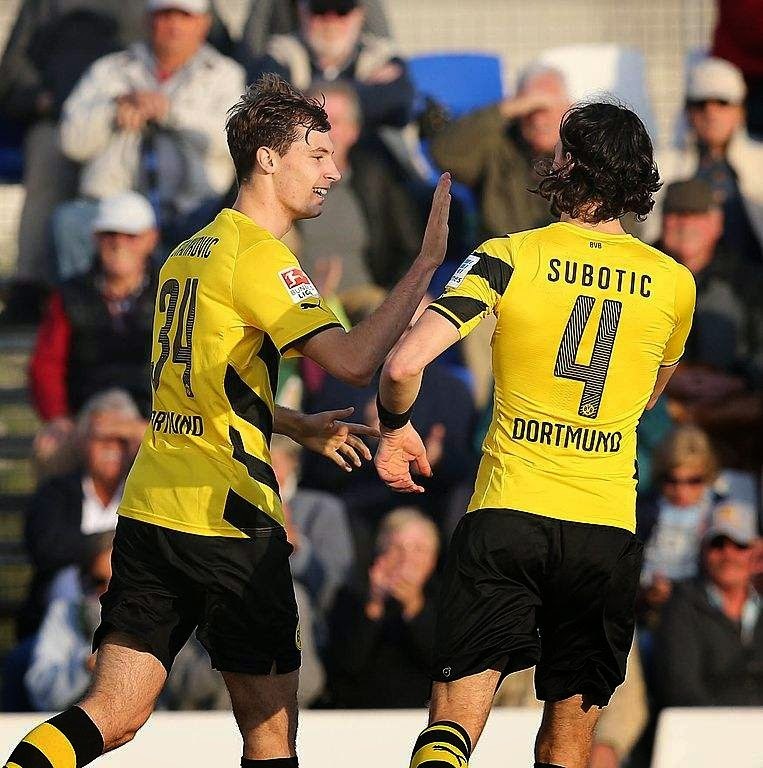 Subotic would partner with the tall Slovenian Stankovic in the center of the defense and Passlack dropping into the right back role. Kirch and Kehl would play in front of the back line, with Dudziak wide left and fan-favorite Kuba again gracing the right wing, something Dortmund fans all over hope to see more of in the second half of the season. Jojic would be in a creative role with Immobile the lone striker. Passlack had a fairly tame effort early on, but the standout performer of the second half was goalscorer Gorec Stankovic, who was solid in the air and adept at intercepting passes and shutting down the opposition. His distribution of the ball was also very good, rarely giving away possession. And the big man scored soon after the break off of a well-delivered corner from Schmelzer, surprisingly scoring with his boot and not his head--a composed first-touch finish with the inside of his right foot. And it was 1-0 to the good guys after 59', an early birthday present for the soon-to-be-19 year-old Slovene. Just after the goal, Dudziak would receive some applause from the modest support at the tiny stadium and make way for Tammo Harder, playing on the left. Kuba looked dangerous on the right, creating several chances with his deep runs down the endline. He flashed one pass across the box which someone, perhaps Immobile, should have tapped in at the back post. He even nearly scored himself. Schmelzer had a solid strike with his right boot and Subotic had some long range attempts, maybe keen to score to celebrate the Serbian New Year. Immobile could have made a simple lay off to an open Tammo Harder in the area, but instead tried a backheel and then attempted to force it through two defenders. 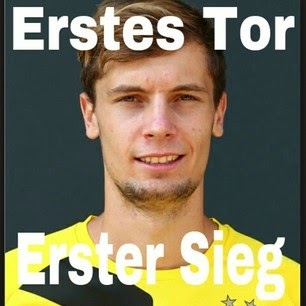 Dortmund will need to be more clinical against Leverkusen to get the three points, so let the preparations continue. Dortmund returns to Bundesliga action against Bayer Leverkusen on Saturday, January 31. A HAPPY NEW YEAR TO NEVEN SUBOTIC, MILOS JOJIC, ZELJKO BUVAC, AND ALL ORTHODOX PLAYERS OF BVB WHO CELEBRATED THEIR NEW YEAR TODAY!